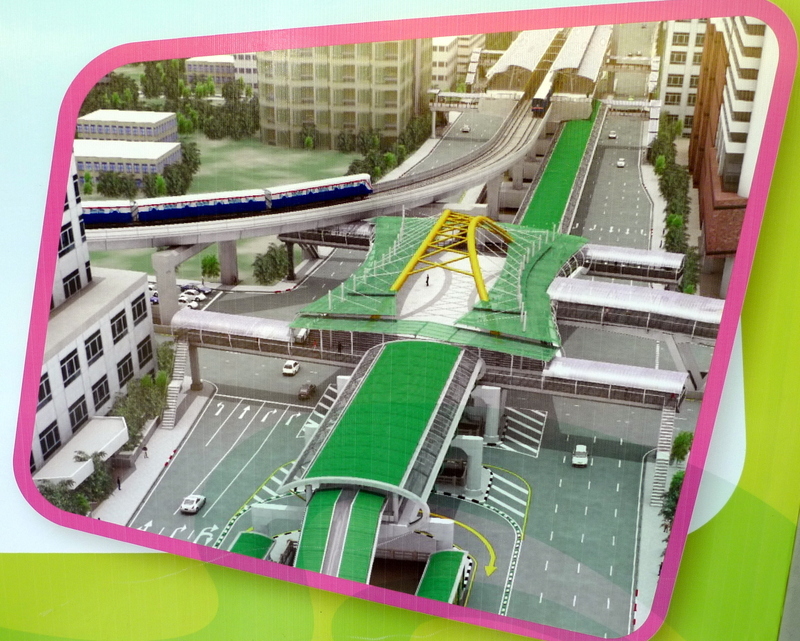 Last June I wrote about the opening of Bangkok’s Bus Rapid Transit, or BRT, line. This new bit of mass transit is basically a light rail line but without the infrastructure costs of adding rails. 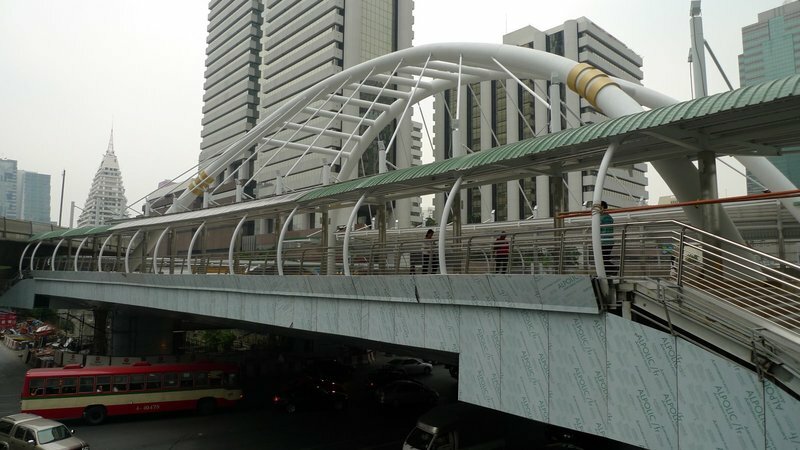 In a bid to connect a growing corner of the city that has never had significant mass transit to the existing rail network, BRT extends from the Chong Nonsi Skytrain station to the south side of the city along Rama III Road. Of course, for the system to effectively feed passengers onto the rail network, there had to be an easy connection, something that was missing at the half-way point of last year. Pictures at the BRT stations promised, though, that a grand, shaded walkway would link the BRT’s terminus with the Skytrain station. I’m glad to report that just a couple of weeks ago, the arched section of the pedestrian bridge opened. There is still some additional work being done including the addition of additional, newer stairs to connect to the bridge from surrounding street corners. This work is proceeding rapidly, though, so I think in just a few short weeks we’ll have a finished product. Nice to see some bit of urban infrastructure actually come to fruition. Looking from the BRT station side of the intersection north towards the Skytrain station. While some finishing touches are being placed on the bridge, it is open and being used. Lots of people were taking pictures of what is a dramatic addition to the skyline. 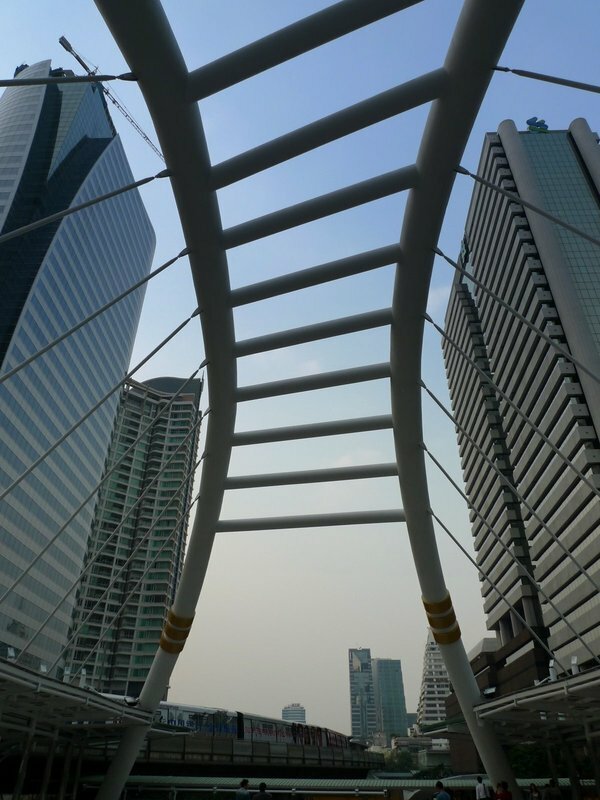 This entry was posted in Uncategorized and tagged Bangkok, Bridge, BRT, City, infrastructure, Krungthep, Pedestrian, planning, transit, urban by christao408. Bookmark the permalink. It does look amazing… I wish people who run this city paid even a 1% attention to Urban design as your city does! My last impression of Bangkok traffic was total chaotic. I noted that public transportation options were slowly improving. Now it seems there are indeed some efforts towards easing the traffic mess. As for LA, it is still a city of 24 hour traffic jam. I really wish they increase the choices of public transportaton here. Fabulous. I can’t think of anything like that in the states. It was neat to see. Thanks for taking me Chris! Seems to me the first photo is a nice shot, with virtually no traffic at all. Oh, I think this is the Silom line, near the Thai Airways office located at some corner street? @christao408 – Oh, how nice the government is upgrading the infrastructure little by little. I’d love to see more of these city scenes in your entries. What happened to that big piece of land next to the Chong Nonsi (or Surasak?) station with some squatters and junk pile? Or is it still developed yet? Just curious. I feel that shows how art and the city can meet to make a beautiful environment for people. @christao408 – Nah no worries. @christao408 – at least it’s starting to improve for you guys there…here, I’m not so sure. I love the geometry of the photos! It was a long time coming – glad it is a reality! Urban planning is always so challenging. I hope they don’t paint the bridge yellow like the painting. @ElusiveWords – I’m hoping they are done with it, too. @murisopsis – Lots of people seemed captivated by the geometry and stopped to take photos as they crossed the bridge. @Fatcat723 – That’s very true, isn’t it? @CurryPuffy – I’ll continue to keep an eye open for these types of subjects, Gary. As for the land next to Chong Nonsi station, it is the future site of MahaNakhon Bangkok, a 77-story condo/hotel that will be a stunner if it is built. They’ve been doing presales for over a year with no sign of construction, leading me to wonder if it is going to be built or not. wow, interesting bridge design. it must look great in person. wow! This is mastreful and very impressive. The lines, the curves and the whole concept of modernization to help the city’s infrastructure, is truly amazing. It looks great … maybe some plants adding more green to the city would be nice. @beautyandthebum – The other day I was down at Siam Square and there are six or seven large boards out with information about a proposed facelift to the area, a joint project of BMA and Chula. Of course, more trees and greenery is a part of it. But you know how it is here, they set up a planter or put in a tree and then there is no follow up and it dies. Maybe they’ll do better this time? @ZSA_MD – It is quite a step forward, isn’t it? @kunhuo42 – It is very uplifting, actually. 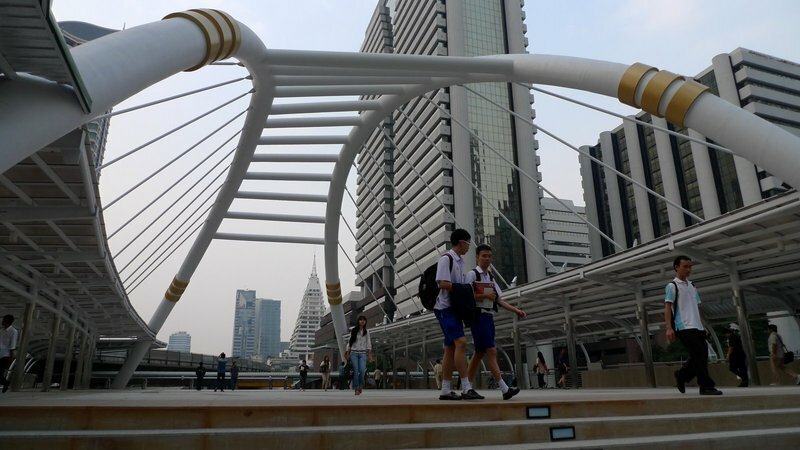 For one of the first times, there’s an urban place in Bangkok that really feels “modern”. It’s nice how a piece of architecture can change the look and feel of a place. @christao408 – Haha, yeah.. they are such draw-cards to Sydney. It’s iconic and is the image of Sydney – that part of Sydney is so open, too, and very attractive to be in.